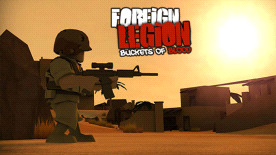 Foreign Legion: Buckets of Blood is a cartoon-style third-person shooter. You take the role of a last-standing hard-boiled Legionnaire taking on an entire rebel army. A small campaign with various objectives, such as defending civilians, escorting a tourist bus and a mass-chicken-murder map. The game includes a ranking system that allows you to unlock new outfits, accessories and of course new weapons. 18 Various Steam achievements: Try to win Chicken Slaughter (killing all the chickens) and Damage Control (sparing all the civilians) in the same game! Fill your buckets with blood by causing suicide bombers to explode prematurely or shoot gory head shots! A dynamically evolving soundtrack that reacts to your actions! A complete arsenal of weapons, including personal air-raid support to slaughter attacking hordes at once. A broad range of difficulty with action-packed fun for both casual and veteran players! Foreign Legion: Buckets of Blood © 2009 Sakari Indie. All rights reserved. All other trademarks and copyrights are the property of their respective owners.